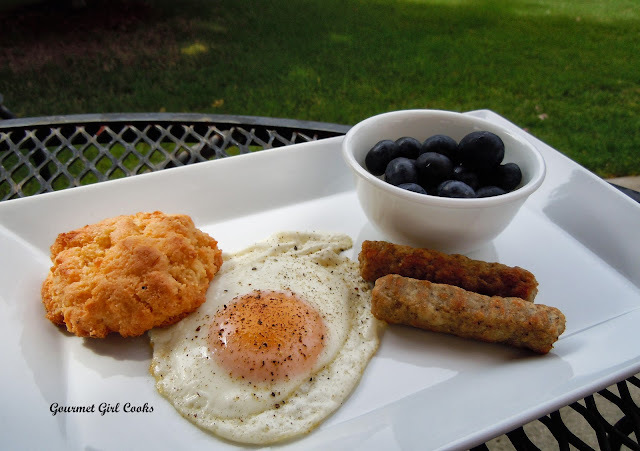 Gourmet Girl Cooks: Happy Saturday...It's Breakfast Time! Happy Saturday! This morning I was able to sleep in late. I don't get to do that often and I feel so refreshed this morning. Hubby and I took our walk quite late last night -- it was 10:00 and we didn't finish up until close to 11:00 after taking Spike for his walk, too. It was cloudy and overcast when I opened my eyes this morning, but I decided to get up and make myself a good breakfast of an organic cage free egg, 2 Applegate chicken sausage links (of which hubby ate one of them), one of my Golden Cheddar Biscuits and some big fresh blueberries that I picked up yesterday. We had rain overnight because everything was soaked this morning. When I stepped out onto the patio to snap a couple quick photos, the sun suddenly popped out and everything looked so beautiful with the lush rain soaked plants and flowers and the sun twinkling on their rain coated leaves. What makes today even more special for me is that, as of this morning, I am now down 62 pounds since beginning my wheat/grain free journey. I wish I had known what a difference removing wheat, grains and added sugar would make for me a long time ago. To think that all this time I feared eating fat and instead followed the dietary advice of consuming plenty of "whole grains" and eating "low fat" and never understood why it was such an effort to lose weight and keep it off. I also thought that losing weight required hours of exercise every day...WHO KNEW that all that advice was incorrect!!! When I began Dr. Davis' Wheat Belly program, I intentionally put it to the test, because I was a huge skeptic -- you could not have been any more skeptical than I was! I did not exercise...but I followed the eating plan and made an effort to take advantage of making the most out of what I "could eat" and did not focus at all on what I "could not eat." Without exercise, 55 pounds dropped off effortlessly and quickly. A couple of months ago, I began walking because I wanted to and I enjoy it, not because I had to in order to lose weight. I have since lost an additional 7 pounds during the last couple months bringing my total lost to 62 pounds as of this morning! My triglycerides have gone from 546 to 115 during this journey and I hope they will continue going down, even though they are considered well in the normal range now (I have never, ever had normal triglycerides before beginning this program due to genetic predisposition). I wish I knew then what I know now! Wheat and grains are not my friend and never were....fat is not my enemy...it has been a complete and total revelation. I don't tell you this to brag whatsoever, because I am actually a very private person...but instead I say this to inspire those that may be on the fence about whether this program really works. 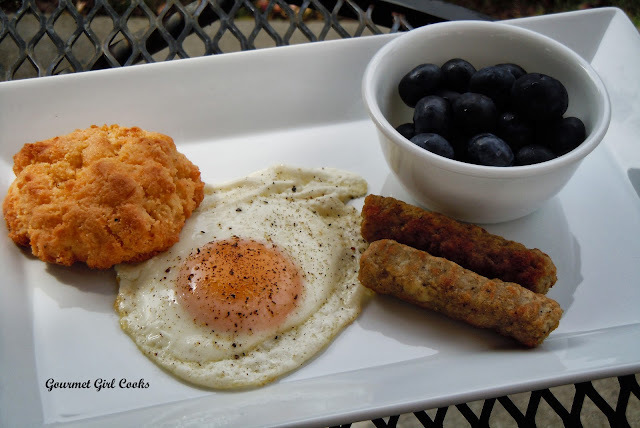 On my blog, there is an almost daily pictorial diary of what I made and ate for dinner, because most of my breakfasts are pretty consistent and my lunches typically consist of leftovers from dinner the night before. I snapped a couple photos of this morning's breakfast below -- it's one that I would have never eaten while following any diet I had ever been on before...life is good! Enjoy! That is really amazing. While I "dabble" in the wheat free lifestyle and watch my sugars and carbs, I have not been able to totally make the switch over. How long did it take you to lose the weight? I have Dr. Davis' book and some of the recipes I have made show such high calorie count when i plug them into myfitnesspal. I get worried because i have a sweet tooth and it's hard to control things especially the baked goods. Would love to hear your thoughts. Great blog and I love your recipes. Thank You for this post,first off that is great about your weight loss!!!!!!! I am beginning the grain free diet myself and it is inspiring to read post like this, I also really LOVE all of your recipes, it helps keep me on track!!! THANK YOU for the post!!! I just figured out that you lost over 7 lbs a month. that is just amazing. I am not fat just a little too much around my middle( thank you Menopause). But I weigh 12 pounds more than I used too. My weight is not coming off, but I will never go back to my former ( very healthy) wink, wink, diet. I have a lot of stress in my life, that could be a cause, who knows. My doctor is not much help, she dislikes my new eating habits and wants me to go back on statins which destroy my leg muscles. I am looking for a new Doc. Now you know more about me than you want to know! Please excuse me! What I wanted to ask you what kind of sausages you buy and where you buy them.(Costco)? Do they contain nitrates? I have rarely eaten sausages due to high sodium and nitrates. Thank you GG. Be well, Barbara from California. How long did it take for the weight to start to shift? I went wheat free for 2 months, and lost nothing. Was not overeating, in fact kept everything to under 2000 cals a day, most days under 1600, with the bulk of what I consumed being one-ingredient foods. In fact my weight jumped 6 lbs in the second month, and I know I wasn't eating 21,000 extra calories. WooHoo! Wow and Congrats! That really is fantastic. I've been on the WB diet now for about 4.5 months and have lost 14lbs. It's coming off very slowly but I'll take it :). My goal is 30lbs so I'm half way there. I had a ravenous sweet tooth and have to say it's still probably one of the reasons I'm not losing more because I still have to have my "sweet" in the evening. However I make sure it is WB friendly, grain free, low carb and sugar free. And I have thank you again as I have before for making the transition easier with your wonderful recipes. I too was a skeptic when I heard about Wheat Belly. Being insulin resistant and having several auto-immune diseases I was feeling badly about myself...so decided to put it to the test. Now, 3 mo. out on it I'm a true believer. I've lost 20 lbs so far. My A1c went from 6.8 to 6, my cholesterol is good, my thyroid is in a good range. We're going to be traveling some this summer, but I'm taking a cooler and my Nutri-bullet along and will do my best to adhere to my program. Having a sweet tooth like someone here proclaimed...yes there was withdrawal BUT you can get your cravings under control and eat better, more healthy snacks!! I've also been eliminating sugar from my diet!!! For exercise...I water-walk laps in the pool 3 to 6X/week. It's great resistance exercise!! I might add that I'm 68 yrs. old so it's never too late!! It's exciting to read about your great results! Congratulations! And thank you for posting all of your recipes. I appreciate it. The one food I miss is pizza, and I plan on trying yours sometime soon. Thanks so much for sharing your wonderful story of success following the Wheat Belly plan, it is very inspiring to me and many others who follow your blog. I started the Wheat Belly plan 3 months ago and I just keep "knocking on wood" because I feel like I have finally found the answer to losing and keeping off the weight! I can't believe how little appetite I have and that I have finally stopped craving carbs and sweets that usually sabotages any diet plan I start. I really appreciate the time and effort you put into this blog DAILY, as one of the overwhelming aspects of this lifestyle is figuring out what to cook, bake, or eat on the run; so I was very happy to have stumbled upon your blog. THANK YOU and CONGRATULATIONS on your success!! Hi, I have just ordered the WheatBelly Book, but have been following the blog for a few weeks. I have been sugar free (well, as near as can be) for 7 weeks now & my muffin top is disappearing just nicely. I have never been a big bread or pastry eater so thought going wheat free would be easy. But I'm struggling as wheat seems to be in everything. When I have read that you eliminate all starch, does that include potatoes, rice & gluten free pasta? I have been on the fence about WB for months. I lost 40 lbs. 3 years ago on a "low-carb" WW type of program. It all crept back on, and I never reached my goal (I have more than 100# to lose). However, I am fascinated by the WB way of life. I am going to give it a try and dedicate myself to it so I too can enjoy amazing results. Thanks so much for the great recipes, etc ... I think I too am super carb-sensitive. I have always burned out on an Atkins-type eating program, so I am excited to make WB a new ay of life. Thank you, thank you, thank you!!!! Thanks for your response. I use the NuNaturals alcohol free stevia drops and I love them. I also youw Swerve as Maria Emmerich (www.mariahealth.blogspot.com) recommended that product. You have really made me think a lot about finally going wheat free. You are an inspiration! Thank you! Hi, GG, I just wanted to add my congrats to the long list! I can so relate to your comments: I used to feel guilty if I put a pat of butter on pancakes or 1/2 & 1/2 in coffee! Now it is the complete opposite and seems strange to so totally change your way of thinking/eating after so many years. Like you, I wish we'd known this info years ago-I so wish we could've raised our kids w/this info! I guess all we can do is be glad we know what we do now and go forward. I do so enjoy checking your blog every day, you have become part of my day and are such an inspiration. Keep up the good work! Continued good health and happiness to you. Thanks again for being such a wonderful inspiration for so many! Congratulations on your amazing results! I have made some of your recipes trying to see if I could find recipes to keep me on a "wheat-free" track and they have all been delicious! I haven't fully eliminated all wheat yet but feel like that may be the key as with everything else I try my weight goes down a few and then right back up and I notice on days I eat without wheat my unhealthy thoughts about food seem to diminish. Is your husband also eating completely wheat free? I think that is my stumbling block; preparing two meals while my cravings are still present. Any advice on how to cook one meal while sticking to your individual food plan? Yeah ... My sentiments exactly, GGC. Somehow the thought of digging into a big glob of coconut oil just doesn't do it for me! "Fatty Coffee" looks slightly more interesting, but all the butter, heavy cream, coconut oil, and almond butter they put in it just seems a *bit* over the top! Hi GG, are we not supposed to use heavy cream instead of *half and half* The latter has more carbs. I am puzzled by that. Even Dr.Davis has recipes using *half n'half. I do not know what to make of it! Barbara. Hi Barbara! I use both interchangeably in coffee. I figure since it such a small amount, it doesn't make too much difference. Most of the time I only have 1 cup of coffee (especially in the hot weather)...in the cool weather, occasionally 2 cups. But, you are right, heavy cream is less carbs than half and half which is half milk/half cream. I think if you are using it in smaller amounts, it's okay.